Welcome! Have you come to this page because you have previously heard about the Intercultural Digital Storytelling Project (IDSP)? Or perhaps because you attended one of our previous Fall 2016 community-initiated conversations? Or maybe because a friend thought you would be interested in storytelling events on campus? Or because you just love listening to the MOTH Radio Hour? No matter how you learned about NEST you have come to the right place! Who are the people you see every day, the people you seek advice from, the people you laugh with, the people you say hi to? And who are those people you know are on-campus but rarely or never interact with? The first November Experimental Story Telling (NEST) event is an opportunity to identify those nests where growth and cultivation happen, as well as reflect upon and expand who is in our nests. Through this experiment we hope that you walk away with some new stories and connections, as well as some novel perspectives on the MIIS community. Intrigued? Continue on to learn more, and sign yourself up for NEST. What will happen during NEST? 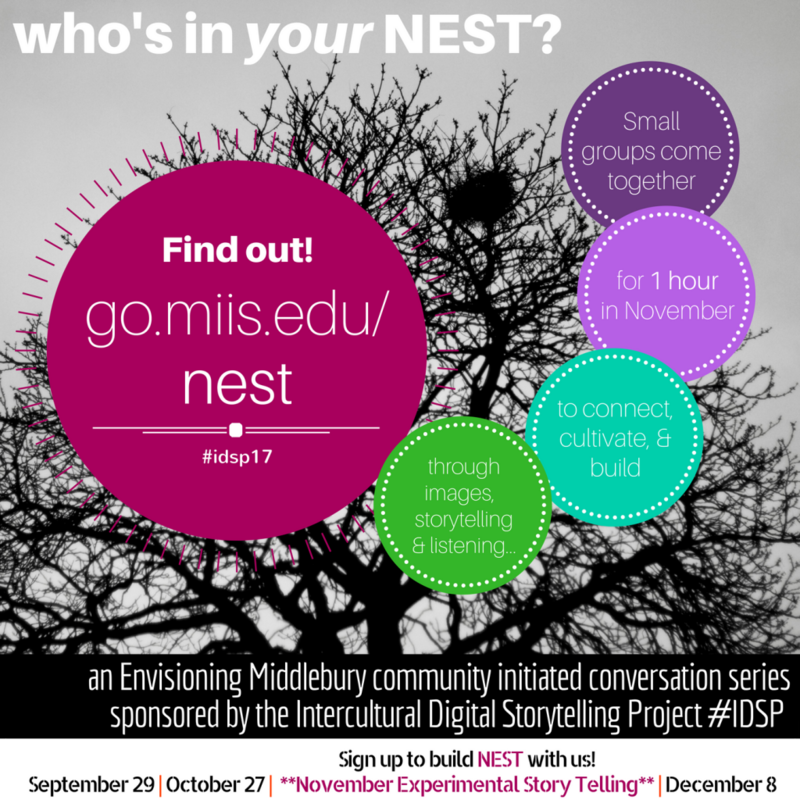 MIIS community members (students, faculty, staff, alumni) will sign up to participate in a one-hour experimental storytelling session. When you sign up (below) you will provide the organizers with some basic information about yourself, a picture that captures a relationship you are involved in, and your availability for November 11 – 21. Based on the information you share, organizers will place you in a small group with other MIIS community members. You will then be given a time, date, and place to meet with your group. We will provide a member of the group with a NEST storytelling kit, with some some instructions to help shape for your meeting (which will include storytelling and story listening). If you are a member of the MIIS Community interested in connecting with new people and broadening your perspective, then NEST is right for you. Being open to participating in group discussions, willing to share some of your own stories, and interested in meeting new people are great attitudes to start with in NEST. Do I need to bring anything to NEST? No. Just bring yourselves and your stories! Does anything happen after NEST? We will be hosting a NEST gallery event on December 8th at 12:15 – 1:45 pm, to which the entire MIIS community will be invited. After you sign up, be sure to keep your eyes peeled for your NEST group meeting invitation. Please also share this link http://go.miis.edu/nest with your friends and colleagues. Thanks! Copyright © 2019 Intercultural Digital Storytelling Project (#IDSP). Powered by WordPress. Theme: Accelerate by ThemeGrill.